Eye On Tampa Bay: Bias, Ignorance or Incompetence? Recently our local media reported about a survey regarding Greenlight Pinelllas conducted by an organization called "People's Budget Review". We're looking at how this unscientific survey done on Facebook and email was reported by the media compared to an actual poll done of "likely voters" in January by a polling firm. most Pinellas voters associate Greenlight only with its more controversial light-rail element and are in the dark about the plan’s bus improvements, according to a new survey of 1,600 residents by the People’s Budget Review, a group that includes local trade unions, activists and neighborhood associations (emphasis mine). With less than eight months remaining before Pinellas voters decide whether to support a tax increase for bus and rail, a St. Petersburg-based group's survey has found that most voters don't know the details of the proposal. But an unscientific survey of 1,600(emphasis mine) registered voters in Pinellas conducted by the group People's Budget Review found most respondents were familiar only with the rail portion of the plan. Distributed via Facebook and email, the group's survey (emphasis mine) did not target people of different backgrounds or likely voters. The People’s Budget Review is an alliance of community advocates, local business owners, union members and residents working to ensure all residents have a voice in how local tax dollars are spent. "Our main priority is that, this is going to be on the ballot — do people even know what it is? And after informing them a little bit about what it is, would they vote for it? That's our primary take right now," says Hunt of Awake PInellas (emphasis mine), one of a myriad of activist and neighborhood groups who make up the PBR, which formed a couple of years ago to help ensure citizens' having a voice on the budgeting process in the city of St. Petersburg. ….their survey (emphasis mine) of over 1,600 people…. Awake Pinellas' mission is to be a networking center for organizers to manifest a progressive (emphasis mine) agenda. "We are being careful not to sway voters, but to make them aware of this ballot and its details," said Bob Lasher, spokesperson for the PSTA. Oh my - let's digress a moment on PSTA's Greenlight Pinellas campaign: Making people aware of the ballot doesn't require chip clips, pens, refrigerator magnets and goodie bags and spending almost a million taxpayer dollars. A recent poll, (emphasis mine) sponsored by the grassroots organization (emphasis mine) People’s Budget Review shows 57 percent of those surveyed support Greenlight Pinellas while only 30 percent said they would vote “no.” According to the survey, Greenlight is most known for its long-term plan to link downtown St. Petersburg and Clearwater through light rail, and the fact that 65 percent of respondents associate Greenlight with light rail is not a good sign for those who have made “No Tax for Tracks” the rallying cry to defeat the referendum at the ballot box this November. In January, this actual poll was conducted by the SunBeamTimes blog: 61% say “No Tax Hike” for Pinellas Rail. Few Will Ride the St. Petersburg-Clearwater Train. The Sun Beam Times poll was conducted through the respected polling company St. Pete Polls. The Sun Beam Times poll was conducted only among Pinellas County registered voters who voted in the off-year 2010 election – likely voters in 2014. A new poll on the Greenlight Pinellas campaign to build a light-rail system and put more buses on the road has sparked controversy about whether the survey misled residents. Creative Loafing: David McKalip touts new poll on Greenlight Pinellas, but were the questions misleading? A new poll published on Monday finds large opposition to raising the sales tax in Pinellas to improve the county's transportation system, but critics say the questions asked prevented an accurate measurement of public sentiment. Tampa Bay Times: Poll commissioned by rail opponent shows Greenlight Pinellas on "shaky ground"
But as Creative Loafing’s Mitch Perry noted today, the referendum’s supporters will just as readily dismiss these survey results as skewed. In addition, in much of the media reporting about the McKalip poll, they included a previous poll by Tampa Bay Times/BayNews9 reflecting a 56% support for Greenlight. No such reference to McKalip's poll showing large opposition to Greenlight was made in the media reporting of the People's Budget Review survey. David McKalip is a neurosurgeon in St. Petersburg, a previous candidate for St. Petersburg CIty Council who opposes Greenlight Pinellas and supports the grassroots organization NoTaxForTracks. Were there attempts in the local media to discredit McKalip's professionally done poll? We found no such discrediting in the reporting of the People's Budget Review survey. So why was so much credibility given to the People's Budget Review unscientific survey? Who is the People's Budget Review organization? FPSU collaborated with the Coalition of Neighborhood Associations (CONA), Suncoast Sierra Club, League of Women Voters, Agenda 2010, NAACP and many other local organizations. It resulted in Peoples Budget Team. 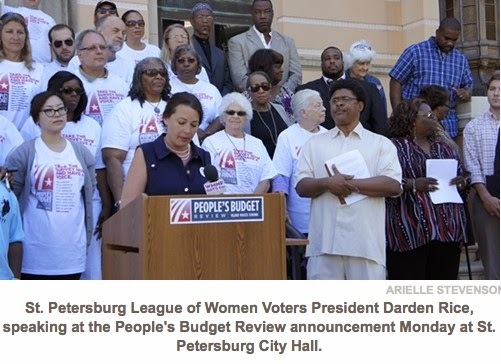 A coalition of neighborhood groups, civic groups and union members, the People's Budget Review is primarily funded and organized by the Florida Public Service Union (emphasis mine), which represents 1,200 workers in St. Petersburg. 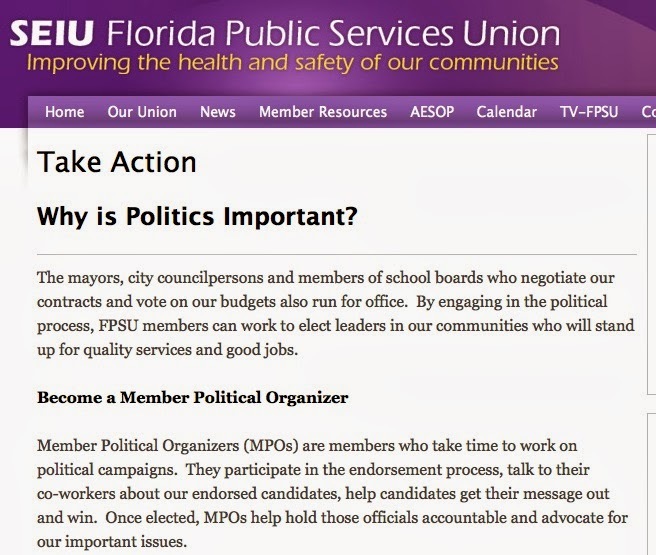 The Florida Public Service Union is associated with the huge SEIU union. SEIU Florida Public Services Union members are the driving force behind reliable public services and the voice of public employees throughout Florida. SEIU public services members are the driving force behind reliable public services and the voice of public employees throughout Florida. The Tampa Bay Partnership is absolutely wrong in misrepresenting People's Budget Review as a grassroots organization and in calling their unscientific survey a "poll". Since when did a well funded government labor union representing government employees become grassroots? SEIU/FPSU is not a grassroots organization. The People's Budget Review is largely funded by and associated with the FL FPSU union, an arm of the huge and powerful SEIU union. The People's Budget Review organization is part of a professional political activist organization active in voter registration, electing candidates where their members can contribute to the campaigns of pro-worker candidates. We want to get you the facts and find out how expanding public transit can work for all residents. After all, it’s our money. We want to know your priorities around the issue of public transportation, and find out how expanding public transit can work for all residents. We're not sure where the Right to public transit is found. Obviously, the People's Budget Review supports public transit even if they haven't publicly endorsed Greenlight Pinellas. Are they really serious about wanting better bus service, especially for the low income who need it to get to their jobs? Fixing Pinellas bus service can be done without building a $3 Billion train that most likely will require another new revenue source such as higher taxes, cutting bus service or robbing other services or projects - robbing Peter to pay Paul. So why did the People's Budget Review unscientific survey that used Facebook and email showing support for Greenlight get so much local media attention? Why did the local media insert so much pushback in their report of McKalip's professional poll of likely voters that showed large opposition to Greenlight? We know the local media is highly biased in support of a costly rail agenda in Tampa Bay. We are subject to their consistent and on-going pro-rail editorials that coincidentally occur the same day a rail article in their news section is published. Complaining about special interests' hold on government is easy. Doing something about it, much less so. Similarly, a coalition of community groups is pledging to take on the complexities of municipal budget writing in St. Petersburg. The People's Budget Review said this week it hopes to collect at least 10,000 residents' responses to questions about how they would like the city to prioritize spending on public safety, parks and recreation, and economic development. The results won't be scientific (emphasis mine) but will likely be far more extensive than what Mayor Bill Foster and the City Council would normally collect in the annual budget process. The right laid out in the First Amendment of the U.S. Constitution to petition the government for redress of grievances is what sets this nation apart. And while much more attention may be given to large, amorphous campaigns like the Occupy movement (emphasis mine), these groups have a chance to make a real impact by tackling specific policy issues in their local communities. This is how democracy is supposed to work. When do you think the Times or any other local media will acknowledge that the Tea Party has been targeting cronyism, wasteful spending and special interests, regardless of political party or ideology, for over 5 years? You absolutely cannot make this stuff up - it's a simple Google search away.